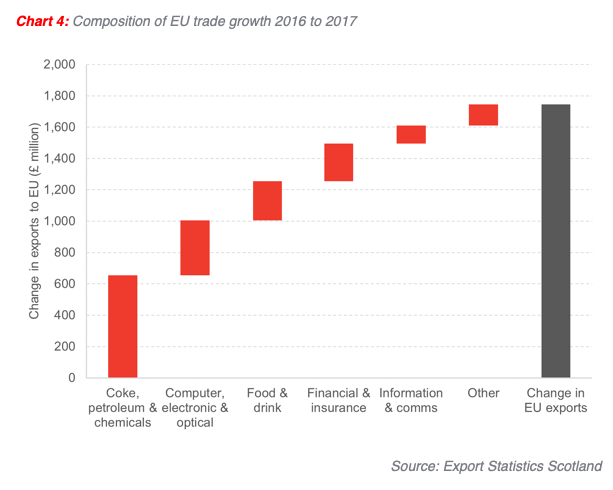 Boosted by the competitive value of the pound and strong growth on the continent in 2017 – where the Euro Area economy grew at its fastest rate since 2007 – the improvement in Scottish exports was driven by a £1.7bn increase in exports to the EU. This was equivalent to a 13.3 per cent rise between 2016 and 2017. Scotland’s exports to the rest of the UK also increased in 2017, up £2.2bn (4.6 per cent). 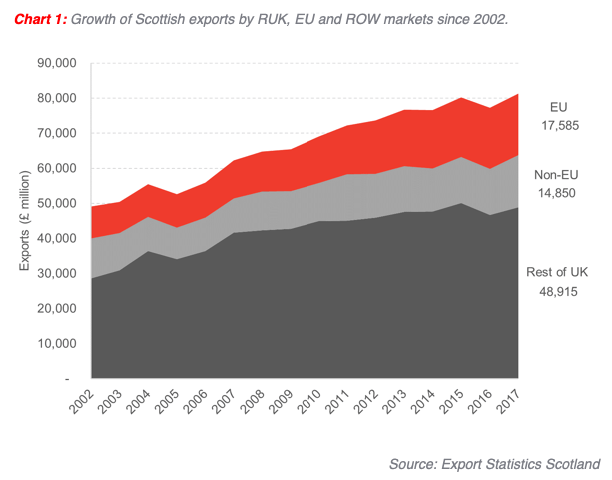 The Scottish Government’s Economic Strategy had a target to grow Scottish international exports by 50 per cent by 2017 (on a 2010 baseline). Despite today’s uplift, the figures confirm that this target has been missed, with international exports up by around 35 per cent since 2010. Which are Scotland’s main markets? Trade with the rest of the UK accounts for around 60 per cent of total Scottish exports (£48.9bn to the UK; £32.4bn to the rest of the world). 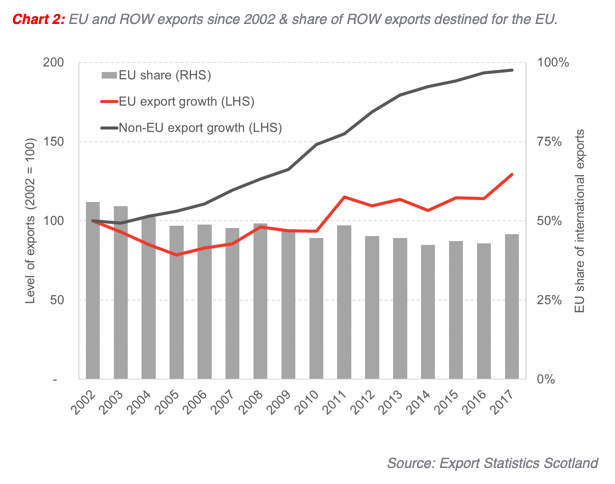 Back in 2002/03, Scottish exports to the EU were around 56 per cent of total international exports, today the figure is 46 per cent. Despite manufacturing only accounting for around 11 per cent of Scotland’s economy, the sector punches well above its weight in exporting. 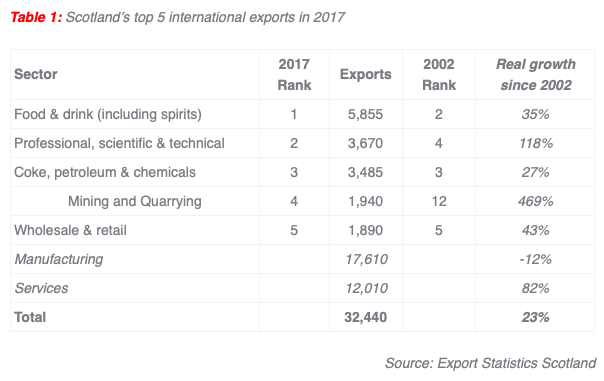 In 2017, around 54 per cent of Scottish international exports were in manufacturing (£17.6bn). In contrast, other areas of manufacturing have found trading conditions more difficult. 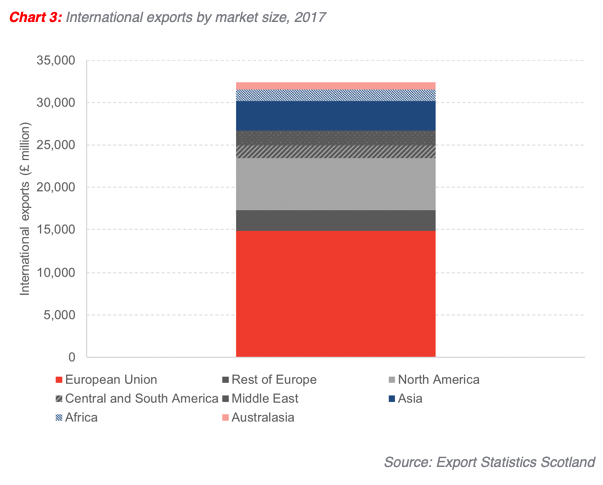 Following the collapse of the electronics sector in the early 2000s, “Computer, electronic and optical products” now exports a fraction – just 34 per cent – of its 2002 level. Overall, growth in manufacturing exports is up 19 per cent– in cash terms – on 2002 levels, but down 12 per cent in real terms. In contrast, services (whilst exporting smaller amounts – £12bn) have grown more strongly. Services exports are up around 148 per cent in cash terms (82 per cent in real terms). Areas like professional and financial services have grown particularly strongly. The latest figures show that for 2017, over 45 per cent of Scotland’s international exports are to EU markets. 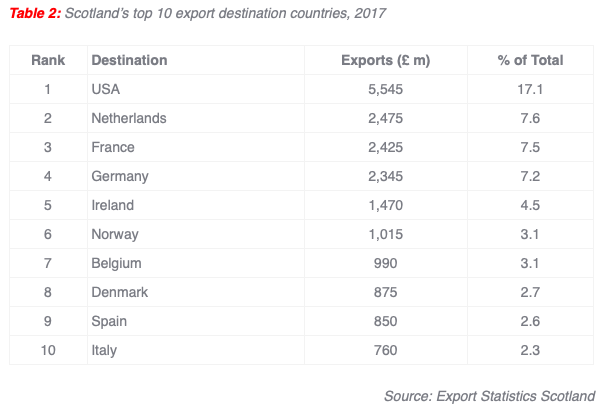 And of Scotland’s Top 10 export destination countries, eight are in the EU and a further country – Norway – is part of the European Economic Area and therefore the Single Market. Firstly, unlike the ONS or indeed the Northern Ireland Executive, the Scottish Government lack the ability to compel firms to respond to their request for information on export activities. This means that the response rate to the sample is low (around 25 per cent).